To state this from the very beginning of this post: the dive I did on Saturday will be one I won’t forget for my whole life. After almost three weeks of flu an cold I finally hit the water again (just to end in bed again the next day…), we decided to dive The Steps in Kurnell to hopefully take some good shots of the weedy seadragons. We found our first victim very quickly and got our cameras going. On the way towards the Leap we saw a few cute nudibranchs and while Matt was entertaining himself looking for seadragons I discovered an octopus and started shooting close-ups. I heard some strange and fairly loud noise I was not able to categorize and kept concentrating on the octopus. When I heard the noise again, very loud, and a fraction of a second later also Matt, apparently trying to get my attention I slowly turned my head towards the deeper water. While turning most of the available light was suddenly gone as a huge object covered the sun. 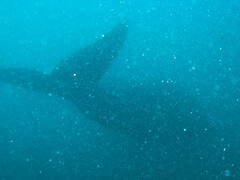 A humpback whale. In full speed. At a distance of not more than 3-4 meters. Shock and excitement were a potent mixture, I started breathing heavily, staring disbelieving at the unexpected guest. The whole encounter was over after a second, I was just able to rise the camera with whatever setting was on and take a shot. The tail of the whale is visible, proof enough for me and Matt that we were not dreaming. On one hand we had been really lucky not to be even closer to the very muscular tail fin of the whale, on the other hand we had been able to experience the elegance and muscular strength produced by nature as close as not many divers ever will. The octopus was suddenly not all that interesting anymore, for most of the second half of our dive we were just smiling at each other, shaking our heads once in a while. A truly exceptional experience! This entry was posted on August 12, 2008 at 9:23 pm and is filed under Divelog, Diving in Sydney, Nature, Underwater Photography. You can follow any responses to this entry through the RSS 2.0 feed. You can leave a response, or trackback from your own site.